We are pleased to bring you the next major event as a part of Canberra Grammar School’s 90th anniversary celebrations: Gala in the Grounds. Gala in the Grounds – an event designed to ensure all members of our community can celebrate across the day – is the major event in the 90th anniversary calendar. The day will feature an afternoon of celebrations for students and staff, and in the evening the campus will then come to life for parents, alumni and community for an adults-only event. Please find more information below about both events. 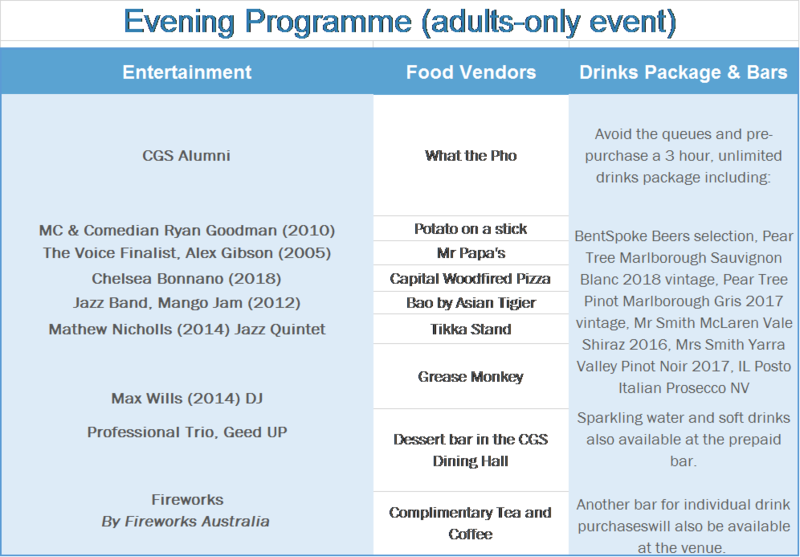 For any enquiries about the CGS Gala in the Grounds, please contact community@cgs.act.edu.au We hope to see you there! The afternoon programme is packed with entertainment for our students and staff. For our Primary School students, we’ll have the awesome children’s performer Jam on Toast and Mr Tim and the Fuzzy Elbows, and for our Senior School students there will be performances by CGS Alumni DJs and musicians, and Geed UP. The afternoon for the Senior School will also be hosted by CGS Alumnus and comedian Ryan Goodman. The evening programme is designed for parents, friends, community, alumni and staff who are aged 18 and above (noting that CGS students are not permitted to attend this event, regardless of age). There will be food available on-site for purchase from a variety of food vendors, and drink packages are available for purchase, or drinks can be purchased on the night from the bar. Click here to download the full Gala in the Grounds programme.